I love to enjoy my days with the kids outdoors especially in the spring. We love going out to the yard or taking small trips around town. So easy recipes this this one are my go-to for these gorgeous days. Mix the following ingredients in a bowl: flour, baking powder, salt and sugar. Pour in the milk, eggs and butter (melt it first)in the mix . Mix well until you have a nice and soft consistency. Once done, spray PAM Cooking Spray on a small frying pan. Make sure to spray the pan before turning on the fire. 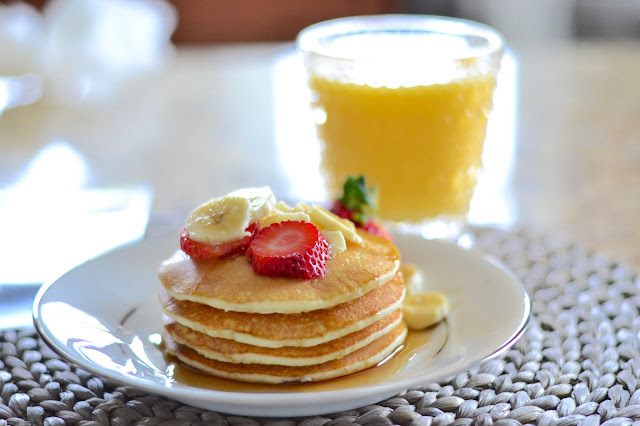 Pour your pancake mix on the pan and voila! 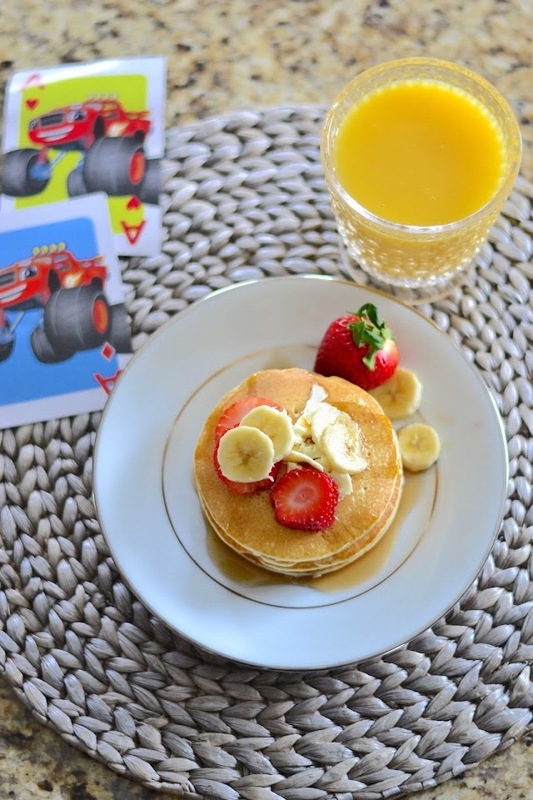 You can make them any size you want, I always choose smaller pancakes for the kids. I serve it with strawberries and bananas even with vanilla ice cream! Depending on what I have in the fridge. Have fun with it and the kids will enjoy it... so will your hubby! 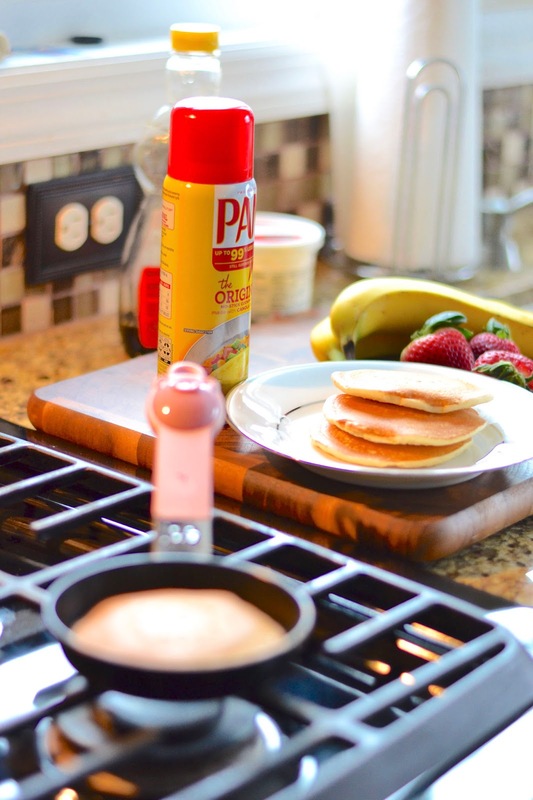 For today's post I teamed up with PAM Cooking Spray to show you how I make pancakes for the kids that don't stick, meaning you can save time on clean-up! Emme loves pancakes and so do I, so most mornings you will find us eating one or three of those, with strawberries and bananas, of course! I don't have a lot of time in my days, so whether I am making an easy breakfast like this one, or a more elaborate dinner like the ones you guys see on my snapchat, I rely on products like PAM Cooking Spray that make cooking and clean-up easier. With PAM Cooking Spray, I don't have to worry about that messy sticky brown stuff that sticks on to the pan. Even when I make my eggs, it's truly a life saver... They come out looking picture perfect. And all this extra time gives me the freedom to do what I love most: spend time outdoors with my kids. Now that spring is officially here, we love to have picnics and play soccer and Emme just loves to roll around the grass... yup she's that girl. 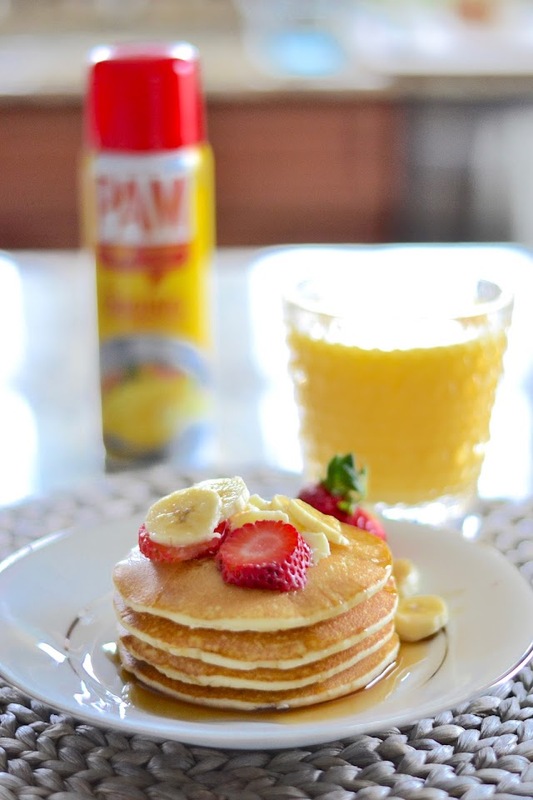 Are you guys a fan of PAM Cooking Spray? I always have it in my kitchen. Any time I can make my life easier, I certainly do that. If you are a woman on the go, you know exactly what I mean.